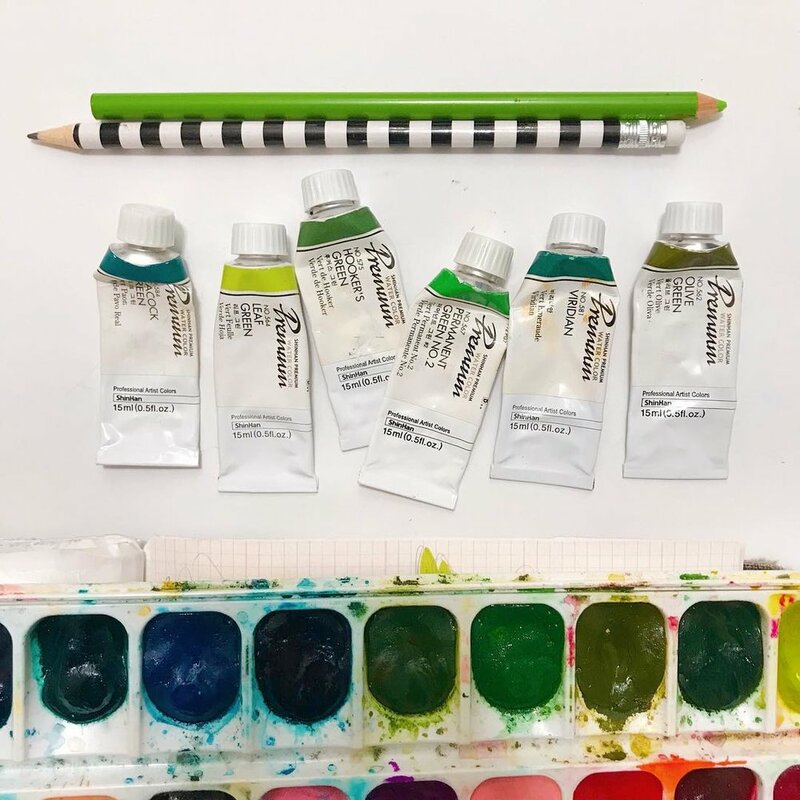 (1) SHINHAN Professional Paint Watercolor: I’ve tried a variety of watercolors and the pigment of professional watercolors is hard to beat. The ShinHan brand (and Daniel Smith) at among my favorites. I buy them in tubes and then squeeze them into a watercolor palette. 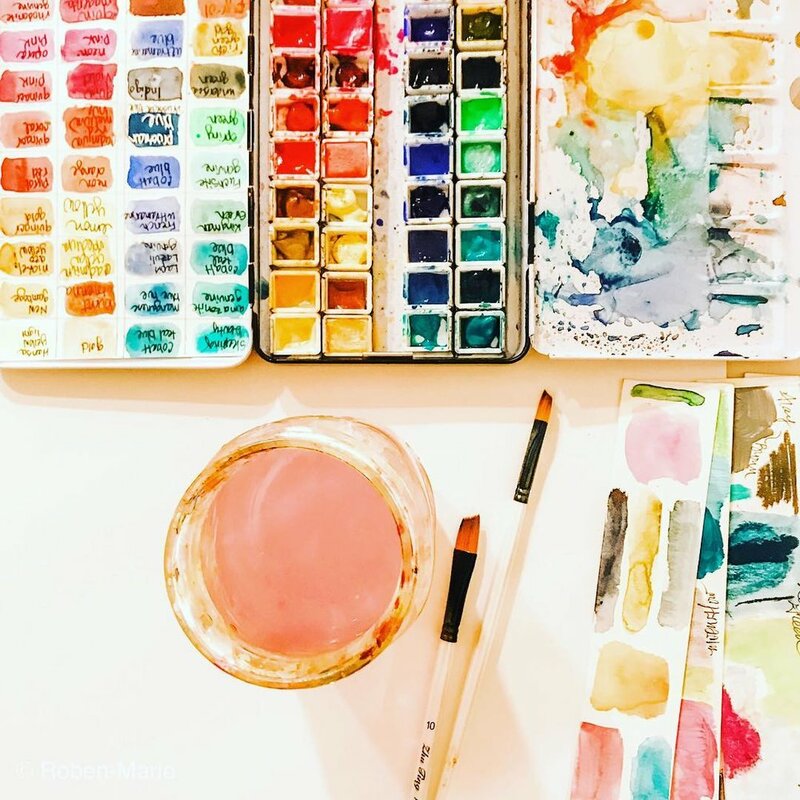 (2) My favorite is the MEEDEN Watercolor Palette and once they dry, they’re ready to use. I especially like the large size of the pans in this case. Just spray with water and you’re all set! Experiment using these acrylics and gesso and see what happens. (3) Sennelier Half Pastels: Wendy Brightbill recommended these extra soft pastels in one of her workshops and I decided to give them a try. They are really soft and I like using them with water and a paint brush. (4) Robert Simmons Simply Simmons Value Brushes: I have brushes of many types and I find myself reaching for my “simmons” all the time. They are inexpensive but are a good quality so I buy multiples of them so no matter how much painting I am doing, I have a clean brush at hand. (5) Prismacolor NuPastel Firm Color Sticks: These rectangle shaped sticks are a joy to work with. The colors are vibrant and they blend well with your finger or water. It's also easy to vary the coverage with different pressure. And, they come in a seeming endless number of colors!! Has your water turned to mud?